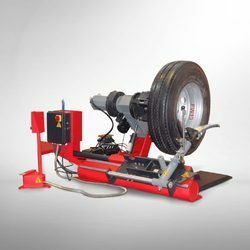 Leading Manufacturer of truck tyre changer and pneumatic truck tyre changer from Mumbai. Handles Wheel From 13" to 17"
We are a leading Supplier & Manufacturer of Tyre Changer For HCVS such as Tyre Changer HCV, Tyre Opening Machine HCV, Elctropneumatic Tyre Changer HCV, Truck Tyre Changer and Truck Tyre Opening Machines from India. this change is used with the help of air supply and hydraulic system and can open any truck ,bus tyre very easily witout any much efforts. Electropneumatic tyre changer for hcvs. 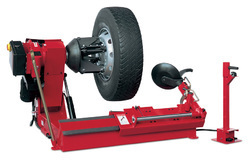 the tyre changer is made with heavy steel for a long lasting operations . easy to use operation with air makes the tyre changing process very easy. Hydraulic Pum Motor 1.5KW 380V-3Ph. 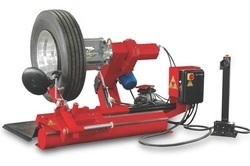 Autoone introduces truck tyre changer which are very very uncommon in the market. people in truck tyre business are still opening the tyres manually which takes almost 1 hr to change one tyre and that too with great pain ,now with the advent of the truck tye changer the process has reduced to only 10 minutes for one tyre and that too without much pain and with added profits. Hydraulic Pump Motor 1KW 3Ph./400V.